What CPU/GPU combo should you get for your gaming laptop? 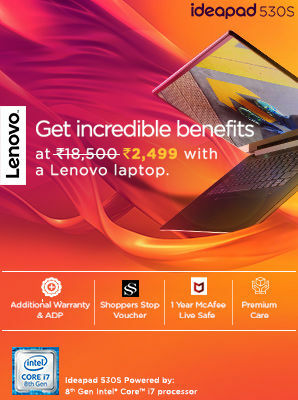 Gaming laptops start from around the 50K price point and go all the way into the 8 lakh territory. With such a vast price spectrum, you get a lot of options with all the different aspects of the gaming laptop. However, we all know that most gaming laptops sold in India are within the 60-90K range and therein we have very little options to play with. By that we mean, the configuration will mostly be an Intel Core i5 coupled with an NVIDIA GTX 1050 Ti or an Intel Core i7 coupled with an NVIDIA GTX 1050. Everything else, practically, remains the same. So the question arises, what should you get? The answer simply comes down to what tasks you’ll be performing on your laptop. Most folks will say that you should get the Core i5 with the GTX 1050 Ti combo and be done with it. While this will be appropriate in most use cases, you really need to analyse your tastes in gaming before making this decision. This stems from the fact that video games these days can either be CPU bound or GPU bound i.e. they can be bottlenecked by either component. So the games / genre that you like to play the most decides what combination you should be going with. Let’s take a look at some of the examples of CPU and GPU bound games. Some of these games are CPU and GPU bound based on the scene that you’re looking at. Any scene with a lot of moving elements within the view cone will increase the CPU compute load. However, in the laptop segment, the bottlenecks tend to occur at a lower level than with desktops so we see a star difference. 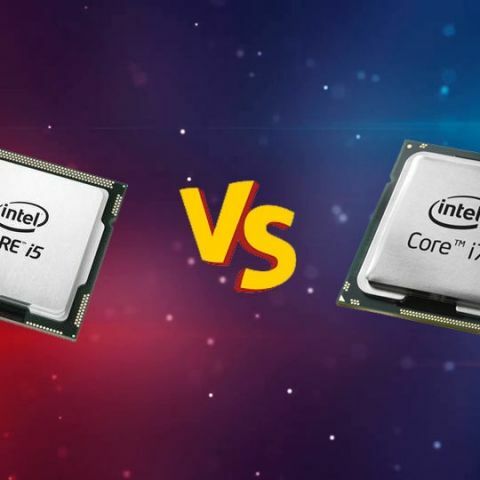 Let’s take a look at some benchmark numbers between two laptops with different CPUs. 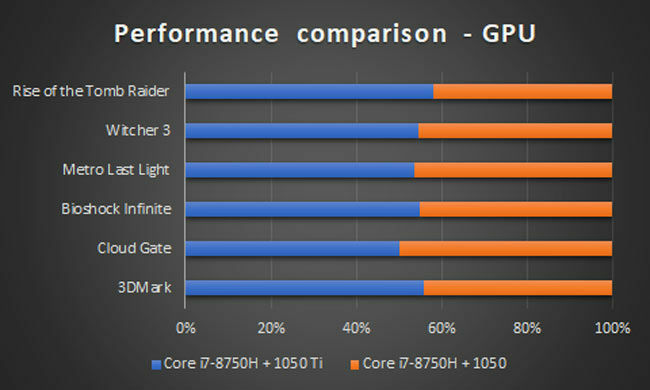 In this case, we see that the performance is largely unaffected because of the different CPUs. The blue bars here represent a laptop with the Core i5-8300H + GTX 1050 Ti combinations while the orange bars represent a laptop with the Core i7-8750H + GTX 1050 Ti combination. 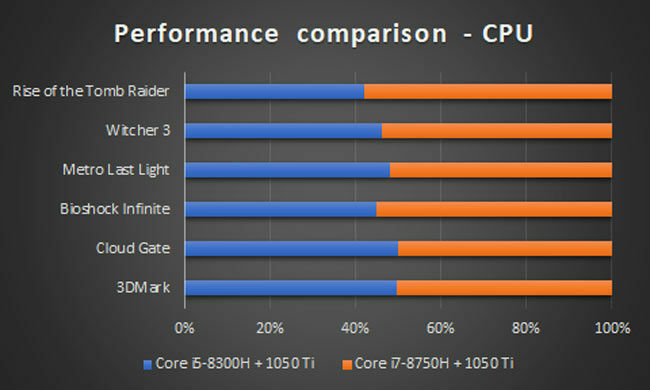 In our benchmarks, Bioshock Infinite and Rise of the Tomb Raider seem to be most affected by the CPU whereas all other benchmarks teeter at the 50% mark meaning that they remain mostly unaffected. On the other hand, when we keep the CPU the same but switch the GPU between the 1050 and 1050 Ti, we see a much larger variation in gaming performance. The blue bars encroach into the orange bars a lot deeper showing how much the graphics card impacts gaming performance overall. If you're going to be largely gaming on your laptop, then it's always prudent to prioritise the GPU over the CPU. However, if you are going to be running a lot of CPU bound games such as the ones we've mentioned in the article, then you might want to focus on the CPU more than the GPU.